We all know the expression “when life gives you lemons, make lemonade”, or as my version of this quote is “…sell them and buy shoes”. Reality is nothing can compare with a homemade lemonade. Still, lemons’ use is not limited in the kitchen only (or to mend a sore throat) but it can be of great use for our beauty regime too. Just like cooking meals at home, the best way to know what’s in our beauty products is to make them ourselves. The acid in lemon juice has great benefits for the skin, hair and nails. Also, there’s the added benefit that all the ideas below smell great. Why spend lots of money to strengthen your nails, clear your skin or highlight your hair when there is a bag of lemons sitting in the fridge? Spots are not something only teenagers have to deal with. They can appear anytime any day, usually before an important date or meeting. Still, lemons’ antibacterial and antifungal properties can come to your rescue. Because they are very vitamin- and nutrient-rich, they are known for their cleansing properties and offer an added bonus during exfoliation. Their juice can help with everything from cleansing and hydrating to clearing up blemishes. For a fast exfoliator no juicing is required, simply cut a lemon in half and rub it all over your face for five minutes and rinse with cold water. For that “rare” spot that might appear unexpectedly, apply lemon juice several times a day using a cotton swab. Acne scars and marks are embarrassing and quite difficult to get rid of. Thankfully, some studies have shown that the acid in citrus juices can help lessen the appearance of scars on the skin. Not only can lemon juice help erase scars, but the oils in lemon also helps essential vitamins penetrate the skin easier, making skin heal faster. 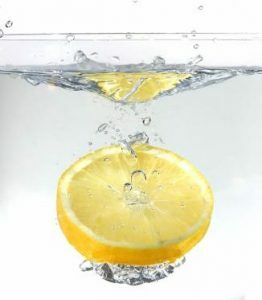 Squeeze lemon juice onto a cotton ball or pad, and rub along the face before rinsing with cold water. Be cautious, however, of any open wounds or cuts on the face, as it can become really hurtful. Nothing can be more annoying than the constant shine of oily skin. Rubbing half a lemon over your face and leaving it overnight will help control oily skin as well as remove blackheads. Just remember, if you have sensitive skin, you will have to first try at a small area of your skin before applying it to the entire face. Long, strong nails have long been a sign of feminine beauty, even though not all women can have them. Nails can become weak and brittle if they spend too much time in water, as a result of the aging process or because of poor nutrition. 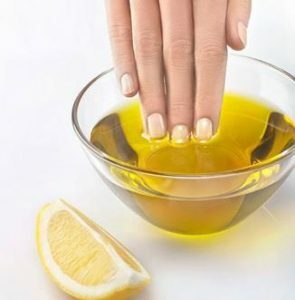 Using lemon juice and olive oil can strengthen the nails and increase their growth; plus you will get rid of any yellowish tinge on your fingernails. Combine three tablespoons of olive oil with one tablespoon of lemon juice to create a mixture. Heat in the microwave slightly (just to feel warm to the touch, NOT boiling hot) and apply the mixture to the entire nail bed of each fingernail and the surrounding cuticles as well as the underside of each of your nails. Repeat the process every night before bedtime. The acid from the lemon helps clear up any buildup on the nails, leaving them whiter while the olive oil hydrates. Have you squeezed lemon juice on your hair in hope that it might give you some natural highlights? Turns out, it actually works. The cheapest highlights you’ll ever pay for involve rinsing your hair (do NOT do it if you have dyed or chemically processed hair) with a mixture of 1/4 cup lemon juice and 3/4 cup water. For extra lightening, sit in the sun until your hair dries. Repeat these steps at least once a week, and you will notice that your hair is significantly lighter. NOTE: if your hair is very dry, lemon juice can make them even drier. Pay special attention in conditioning them really well. Dandruff can be an embarrassing and obvious problem. It is a common chronic scalp condition that results in the skin itching and flaking off in your hair and sometimes on your clothes. 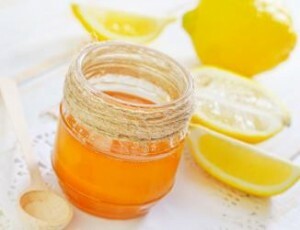 Massaging a combination of raw honey with lemon juice onto your scalp is a simple solution for dry scalp and dandruff. Just squeeze a lemon and take the juice. Mix some honey with lemon juice to maximize its benefit and massage on your scalp for a few minutes. Shampoo and rinse as usual. Repeat every other day for one week and your black shirts will thank you. Lemons can be used as a gentle exfoliator for dry, rough elbows. Add lemon juice to baking soda until you have a grainy paste. Scrub it into your elbows to remove dry, dead skin. Rinse with water and more lemon juice, and soften with moisturising lotion. Taking a bath is a great way to relax after a long day at work. Light candles, put on your favorite music and indulge into a warm bath to soothe the body and mind. Just put a few lemon peels in your hot bath and a pleasant aroma will awaken your senses. Just make sure that the soap you’re using is either unscented or complements the lemons’ aroma. For that extra exotic touch, try to get hold of Yuzu, a highly aromatic citrus used regularly in Japanese cuisine. The Japanese, during the winter solstice, take hot Yuzu baths, to bring good luck and prevent colds and illness in the coming New Year. In no way are these tips intended to cure or treat any type of skin, hair, or nail issue. If your skin is irritated or sun-burned, it is best to avoid using any of the above until it fully recovers. If you suffer from a skin condition, like acne, eczema, you should consult your doctor before trying any of these as they can irritate the skin further. If your skin is extra sensitive, or you are scared about how it will react to a homemade remedy, it is best to do a small patch test first. Have you ever used lemons in your beauty regimen? We would love to hear your ideas.